In my earlier post about Homemade Sourdough Starter, I mentioned that you have to discard part of your starter from time to time. I had a hard time with this concept early on because I thought it was wasteful, and besides, I had worked so hard on my little pet – and now I’m supposed to throw half of it away? Now I understand that there’s a reason for this: in the beginning of creating a starter, you have good and bad things growing in there. It’s good to discard half to allow the good stuff to take over. Also, as the yeast grows it gets hungrier. It needs to be well fed and if you don’t discard, then there are really “too many mouths to feed” in your jar and you’ll end up killing your starter by starving it to death. Another reason to discard is that you’ll ultimately end up with way more starter than you can use – it just grows, and grows, and grows! Because I want to get the most use out of my starter, I began finding and creating recipes using sourdough starter as a key ingredient. The starter gives these recipes a nice tangy flavor that brings them to a whole new level to tastiness. I’ll start by sharing my favorite pancake recipe. 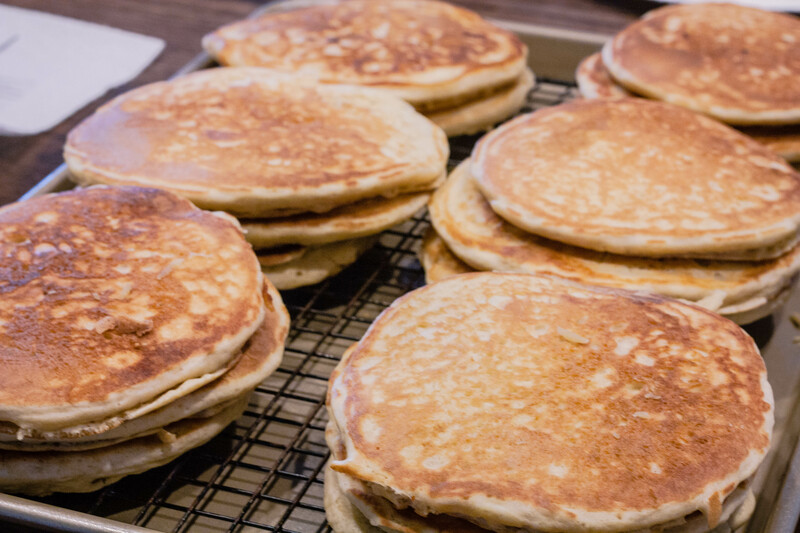 One of my family’s favorite things are Sourdough Pancakes, and they request them often. They are a lighter than regular pancakes and have a tangy-yeasty flavor that makes them uniquely delicious! Since Saturday mornings are usually laid back for our family, I typically make a late breakfast that we can really enjoy. I usually only make these pancakes on the weekend because they are a little more involved than a mix, but don’t let that scare you away. They are well worth the wait! This recipe makes a large batch of about 18 large pancakes. I have three teenagers who can eat a lot, plus I like to have leftovers. 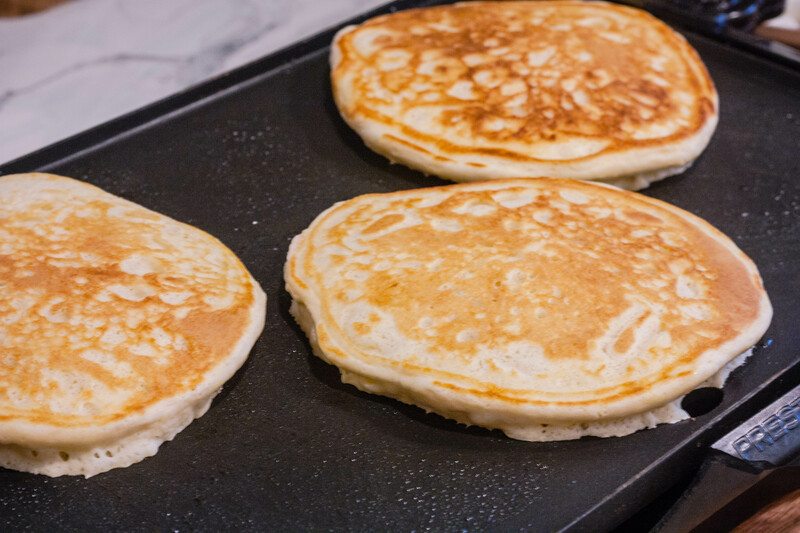 These pancakes freeze and reheat well and are a great quick breakfast on school mornings, so whatever leftover pancakes we have, I usually freeze them. If you don’t want to have that many pancakes, feel free to halve the recipe. Preheat griddle to 350 degrees. In a medium bowl, beat egg whites until soft peaks form. Begin sprinkling in the sugar and beating until all the sugar is incorporated. Continue beating until stiff peaks form; set aside. In a separate cup, combine baking soda and water; set aside. In a separate large mixing bowl, combine starter, flour, egg yolks, oil and salt. Mix well to combine. 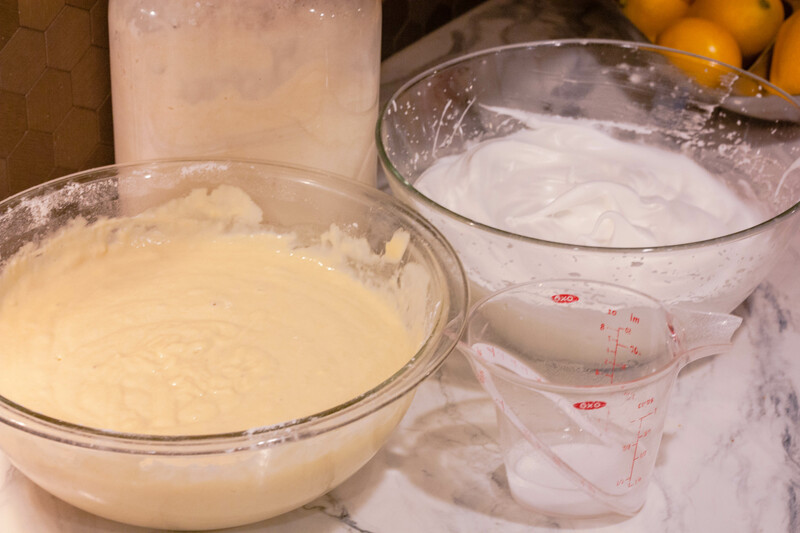 Fold in beaten egg whites into the batter. Gently fold to combine. Right before ready to cook, stir in baking soda water mixture, mix well (batter will foam up). Fold a sheet of paper towel in half, and moisten with oil; rub griddle with oiled paper towel. Ladle about ¼ cup of batter onto hot griddle, using the back of the spoon to spread batter into a round. 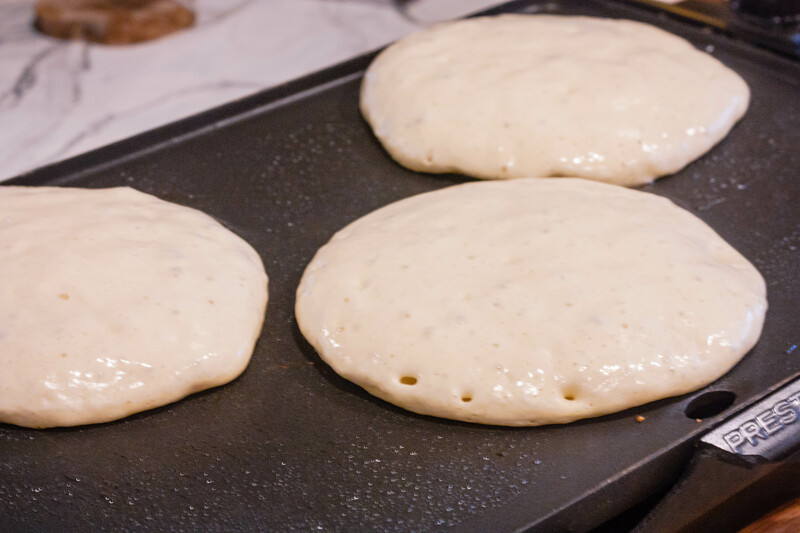 Cook until surface of pancakes have bubbles all over and some have burst, 1 to 2 minutes. Flip carefully with a thin spatula, and cook until browned on the underside, 1 to 2 minutes more. Transfer to a baking sheet; cover loosely with aluminum foil, and Keep warm in oven heated to 275 degrees. Make sure to have all of your ingredients ready to go for a smooth process. Notice how the pancakes will puff and bubbles will begin forming all over, some bursting. 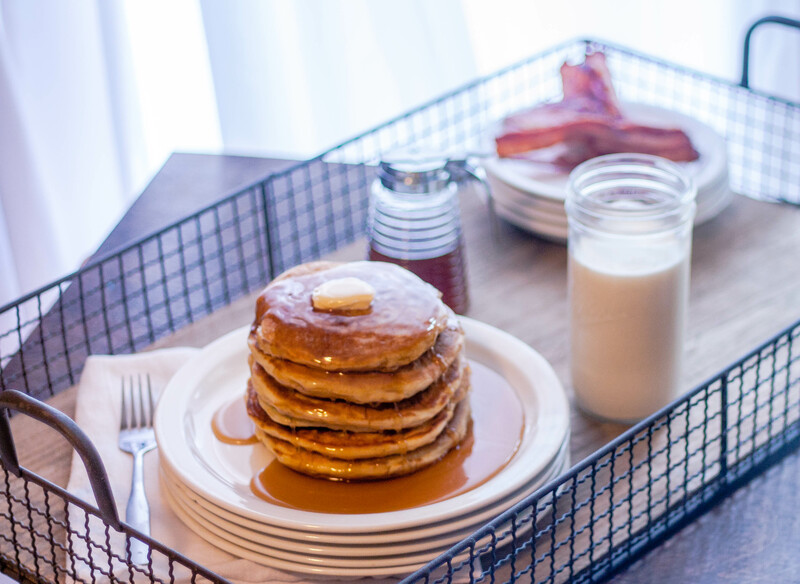 Flip pancakes when they are golden brown. I love the crispness of the outside of the pancakes. Keep warm on a baking sheet in a 275 degree oven while finishing all of the pancakes. Serve warm with butter and syrup! So you would recommend using only the completed starter for these? Not any of the mid-process, discarded starter? You can use the mid process starter, it should be fine. It will have a tangier flavor with mature starter. As long as the mid process starter is active and bubbling when fed, I think it will be just fine.